Richmond Daily Photo: Clothes for Sale? In Byrd Park yesterday I came across an interesting collection of items and no owner. 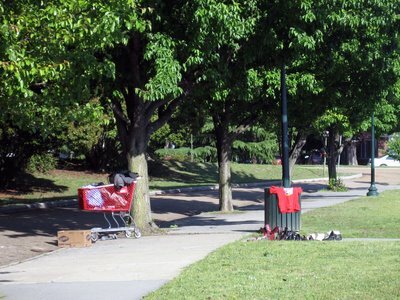 At first I couldn't figure out if there was a man with no shirt on and twelve or so bare feet, but eventually a homeless man came out of the shade trees over on the left and asked me what time it was. I can only assume that he was trying to sell these items--although I'm not quite sure--maybe they just needed a little bit of sunshine. oh ya for sale its new way to sale ?? hmm..may be drying it ?!! good sunshine for that ! Don't we all need some sun this time of year? It does look like a lovely afternoon for airing out one's belongings. Sign of the times, unfortunately. Maybe they were drying or airing out or something. It would have been really funny to watch him try to wash his clothes in the lake though since it's died bright teal! I ardently trust that the help and advice given is relevant to most people . Many thanks .